Time to Hide the Scary and Pull out the Merry! This is the week we will be changing over from Halloween to Christmas. Halloween was awesome, but it takes a lot out of us. 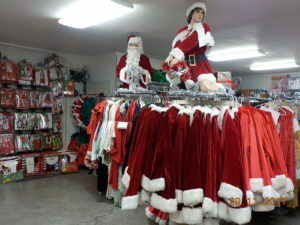 After a little time to rest up and start on the returned rental laundry, we can finally start moving things around and getting the Santa Claus, Mrs. Claus, Elf and other related costumes out on the show floor. For now, here’s a pic from last year. Thank you for your patience.